My son Jasper and his wife (my “daughter-in-love”), Soli, treat us to food from her native Latin America whenever they make a trip back to the U.S. from their home in New Zealand. 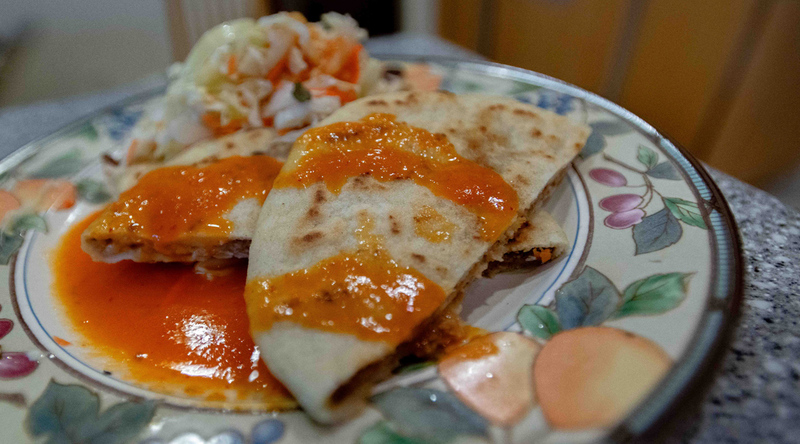 Pupusas, fresh corn tortillas that are stuffed with fillings and then grilled, are the Salvadoran national dish and oh-so delicious! These simple, rustic treats are surprisingly easy to make plant-based. For an authentic side dish with a kick, whip up a batch of curtido, a spicy cabbage relish. Guacamole and salsa also make great, crowd-pleasing accompaniments. 1. In a large bowl, combine the masa harina, water, and salt. Mix until thoroughly combined (the dough will be the texture of very soft play dough). Knead in the bowl for several minutes. Cover the bowl with a clean towel and let the dough rest for 10 minutes. 2. Divide dough into 8 equal portions. With slightly wet hands, roll one portion of dough into a ball and then gently press your thumb into the center to make a cup. Fill with a tablespoon each of beans and cheese. Carefully seal the cup by pinching the top closed. Press the ball between your palms to create a disc shape about 1/4” thick. Repeat with remaining ingredients. 3. In a skillet or on a griddle over medium-high heat, heat the coconut oil (the surface is ready when a few drops of water dance on the surface). Cook the pupusas until golden, 2 to 3 minutes per side. Serve warm with curtido on the side. In a large bowl, stir the vinegar, water, salt, and brown sugar until the sugar has dissolved. Add the cabbage, carrots, jalapeños, and onion. Toss until thoroughly combined. Cover and refrigerate for at least 4 hours or preferably overnight before serving. Want to learn about how what you eat impacts the planet? Visit our Planet page and check out our Green Eater Meter to see for yourself. Suzy is the creative force behind OMD. Her passion for health and the environment lead her to start the OMD movement and write the OMD Book.